Maybe this time it’s for real. Brett Favre, the soon to be Hall of Fame quarterback, is leaking the news that he will NOT be coming back to the Vikings for the 2010 season. The Star Tribune in Minneapolis is reporting that Favre will not return for a second season, ending his career after a bitter loss to the Saints in the NFC Championship Game last January. The person spoke on condition of anonymity Tuesday because the team had not made an official announcement. The person says the 40-year-old Favre called coach Brad Childress to say his injured ankle is not responding as well to surgery and rehabilitation as he had hoped. 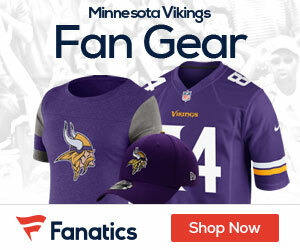 Favre began telling Vikings officials late Monday that he would retire for the third time, NFL sources told the newspaper, which added that Vikings officials and Favre’s agent, Bus Cook, did not returns calls seeking comment. See that? Viking Johns just turns the page, puts on his T-Jax jersey and continues to cheer. This dude has it going on. I’m still not convinced. This could very well be more “As the Farve Turns” or “Days of Our Farve”. It’s not like he hasn’t does this before. Norse lets hope this is just a media play and then the ankle suddenly heals. A high-ranking Vikings official tells the Chicago Sun-Times that “nothing is definite” with Brett Favre’s decision to retire. Bears beat writer Sean Jensen covered the Vikings last year and still has ties within the organization. As always with Favre, the situation is “fluid.” The Vikes still have time to talk him out of the decision, especially if his ankle shows improvement in the next few weeks. It’s worth nothing the Vikes have their bye in Week 4, which falls in early October. We’ll believe he’s retired once he files the paperwork. “Remember, Favre began texting Vikings players and coaches in July 2009 with the news that he would retire. He formally told coach Brad Childress the same thing on the eve before training camp, and within days he was texting Vikings players and asking them how camp was going. All hail the Anonymous Source who broke this story. I’m with you guys on this one. No point getting into a panic, this could just be a bored writer in desperate need of a story, and Favre could be back on the field in the next month or so. Don’t worry Favre lovers, your boy is just doing the “dance”. Remember the stages of Banjo’s return? Fred won’t recap the stages but, he’ll be back. If not now, then later in the season. This guy is a complete richard. He needs to be stroked time and time again, and this is the time of the year for it. Banjo loves riding in on the white horse to save the day. He will, don’t worry. With all that being said, Fred hopes on top of hope that this touch hole goes away once and for all! That’s all there is to it. He’ll be there. Because he hates me. Seriously tho, what kind of guy does this to a team? I’ll tell who; A Green Bay Packer! This way, Favre will always be remembered as a Packer and completely adored by Packer fans for sticking it to the Vikes in 2010. Oh, and by the way, FIRE CHILDRESS!!! Oh course I’ll take all that back and just LOVE the guy if he comes back and takes us to a Super Bowl Victory and Childo will become my favorite coach of all time. Just sayin’. Good day Charlie. Dont forget the relationship with Bevell. Those two seem pretty tight. How’s the Family doing ??? Doin great Charlie. How about you? You had us a little worried around here. Freds thought Mrs. PC took your computer away til training camp could that possibly be true? And I concur Favre will be playing this year.